Each district maintained a list of young men eligible for conscription into military service. Each list recorded all of the men born in a particular town in a certain year. 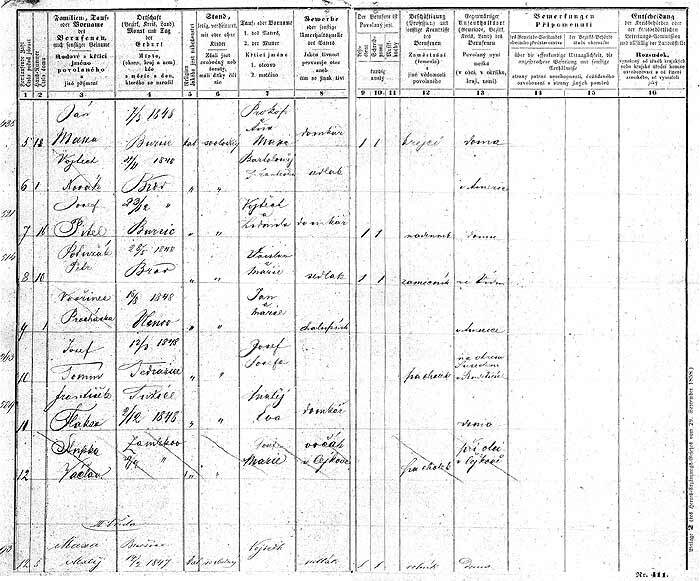 The example below is for men born in 1848 in the villages of Brod, Vlcnov & Bursice. Information contained on the form includes: house number, name, date & place of birth, religion, whether single or married, names of mother & father, occupation of father, knowledge of reading, writing & music, present whereabouts, medical deferment or other exemptions from military service, and sentence in absentia from the regional office. Many of these recruitment lists have been lost or destroyed over the years. It's necessary to contact the appropriate district archive to learn what's available for the town in which you're interested.